A perfect cheongsam is like a well-fitted man’s suit. If made well, a customised piece should accentuate the wearer’s figure, compliment her curves and add poise to her posture. While these are often viewed as traditional Chinese gowns, the style has also been updated and remade in other fabrics apart from silk brocades. Today, there’s french lace, duchess satin and tulle to cater to the twenty-first-century lady. Its popularity is no longer restricted to Chinese socialites and upper-class women. Contemporary designers are reinventing the look of cheongsams in new cuts and textiles, reintroducing them as a the perfect outfit for everything from day-to-day wear to proper formal dresses. If you are ready to invest in one, here are our recommendations featuring the cream of the crop in cheongsam tailoring. Laichan started his eponymous line LAICHAN in 1991 and opened his first boutique at Raffles Hotel. After years of cheongsam and dress making, he has also moved on to create stylish hybrids by combining traditional cheongsam tailoring with Western detailing. The brand’s signature plays with intricate handwork in modern silhouettes. His much-anticipated cheongsam inspired collection at Singapore Fashion Week 2017 did not disappoint and was well received by the media and guests. Letitia Phay and Jade Swee are the duo behind the label Time Taken To Make a Dress. The brand is a fusion of the two founders savoir faire in wedding gown construction and contemporary fashion tailoring. Phay and Swee work closely with their customers in realising one-of-a-kind designs with an artistic approach. Their signature style showcases origami like folds, detailed trims and play on unconventional clothing forms for their unique clientele. Seamstress and cheongsam maker Li Qiying have been designing cheongsams for more than 30 years. Her meticulous patterning and sewing has attracted many return customers. However, in recent years, she has seen a demand in making them in casual materials such as lightweight cotton in a variety of prints and colours. While Li takes on custom orders for wedding cheongsams, most of her customers actually enjoy wearing her pieces as part of their day-to-day outfit. The embellished laced tulle cheongsam is one of the most popular items at Amanda Lee Weddings. These are often made out of meticulously cut floral lace patterns and detailed bead work. Besides the tulle material, you can also consult the designers at the studio to get your cheongsams made in other luxurious fabrics like silk and duchess satin. Another sought after boutique where you can get your cheongsam made for formal occasions is Divine Couture. 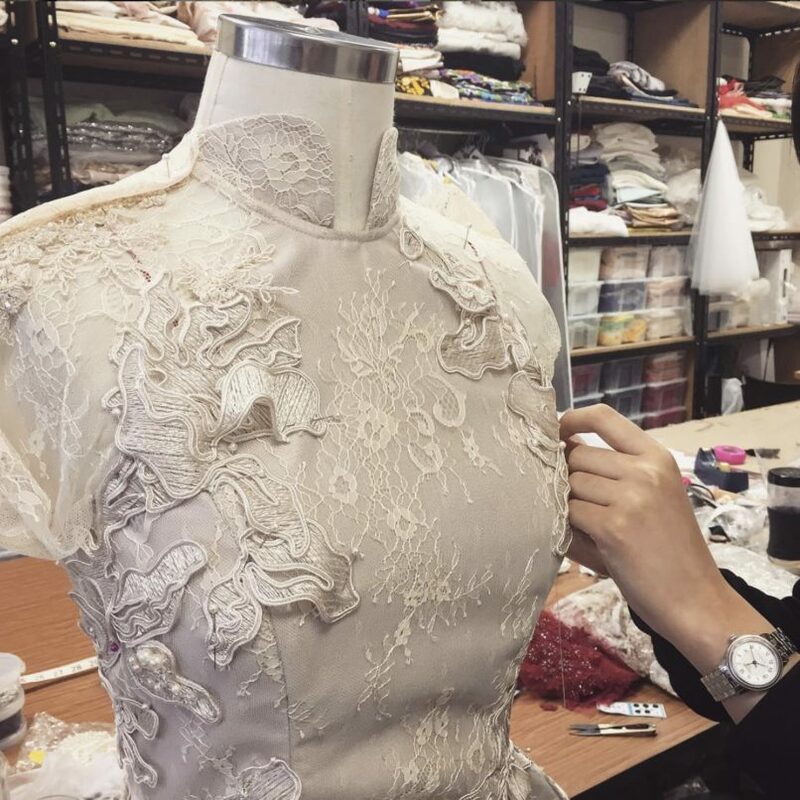 Apart from their wedding gown range, brides who are looking at wearing a cheongsam-inspired gown for their big day can also customise their piece here. The boutique’s white patterned laced cheongsams are a favourite among its customers.